Why it's never too late to go "back to basics!" Would you like your dog to be polite when visitors ring the doorbell and to come when called? You can have that and much more by following the instructions in this clear and concise training guide. Each of the six chapters describes one week of progressive exercises that will teach your dog to listen, respond to basic cues like “Sit, Stay and Come,” and pay attention to you instead of the squirrel next door. 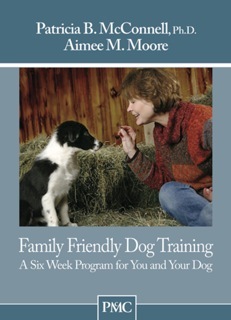 Dog lovers and trainers love this eBook because it’s as friendly to people as it is to dogs! Whether you’re in dog training classes already, or training on your own, Family Friendly Dog Training is there to support you through the first stages of teaching your dog to be a happy and well-behaved member of the family. Stand out from the competition by using the eBook and training curriculum developed by Patricia McConnell and Aimee Moore after 20 years of training class experience. Use the eBook for ideas on class structure. Establish lifelong clients by providing effective and science-based training resources along with good medicine. We all know how serious behavioral problems can be--Family Friendly Dog Training is an excellent resource to help prevent problems in the years to come. So many problems and so little time! Family Friendly Dog Training is an invaluable resource to support our one-on-one work with clients. Everyone will profit from enhanced communication between owners and dogs, an understanding of what is expected, and enthusiastic responses to standard cues like sit, down, come, stay and leave it. Increase the adoptability of your dogs by taking a few minutes a day to teach a some basic exercises. "Practical knowledge, presented in a friendly, down to earth style. I heartily recommend it." "Delightful! Another valuable book from Patricia McConnell." implemented exercises for owners seeking a well behaved family pet. "We have had overwhelmingly positive feedback to Patricia's books here in Germany. we recommend them during all new puppy and new dog visits."